USE WITH WHITE PADS FOR GLOSSY FINISH ON WAXED FLOORS. 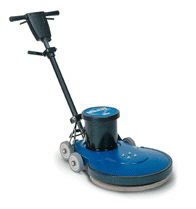 * Please call us for any questions on our polisher burnisher elect. hi speed 20 inch rentals in Portland OR, Gresham OR, Milwaukee OR, and surrounding metro area.